LTO server equipped with an LTO-7 drive. Store up to 6 TB of video and audio media on LTO-7 tapes when used in uncompressed mode. Fast maximum transfer of 300 MB/s (2.4 Gbps), using an optional high-speed interface. Be prepared for high-capacity 4K archiving and backup. LTS-70 deployment in a network environment dramatically streamlines workflows that involve backup, archiving, or repurposing of material. 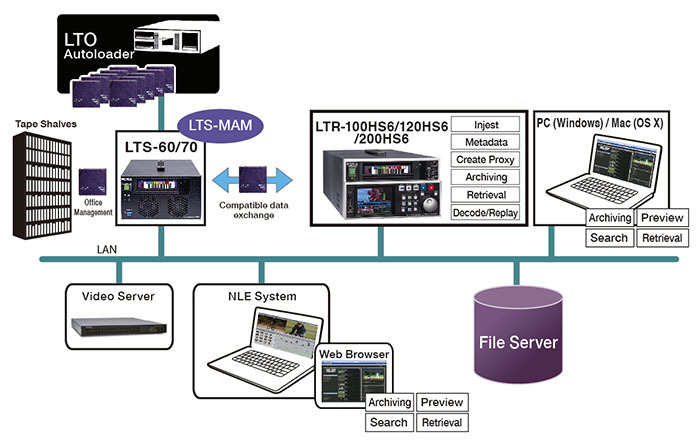 Combining the LTS-MAM material file management software with the LTS-series LTO server creates an archive system.